November 2011 - After successfully completing developing, testing, and several early adopter installations, PerfectLaw® officially announces the formal release of iSlips for PerfectLaw®. 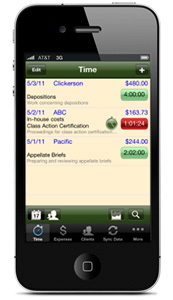 iSlips for PerfectLaw® is an application for Apple devices that allows users to capture time on an iPhone, iPad or iPod Touch. With this new app sending emails and making phone calls creates time entries validated against PerfectLaw® client matter data stored in a local database on the Apple device. 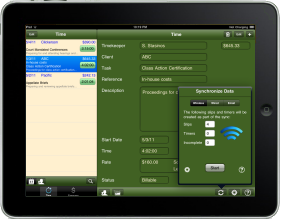 These or other time lines entered are synced wirelessly on command with the user's PerfectLaw® time sheet. A quick overview demonstration of the iSlips app features can be viewed in this YouTube video. About Brain Freeze Software, Inc. The company was founded by Steve Stasinos, a software industry professional with over 20 years of experience. His experience includes customer-centric design, development, architecture, quality assurance, project management, and customer service. Click here for more information from the application developer. For additional product information, please contact our sales department.